Who doesn't love a taco pizza? But in summer when it's too hot to cook it may not be that appealing. 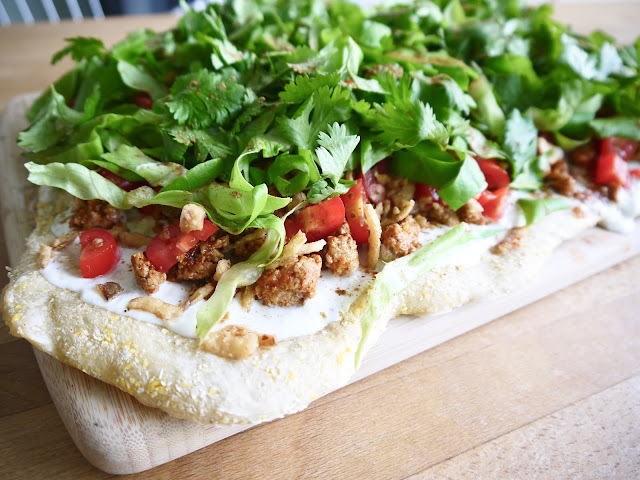 This pizza uses chilled ingredients (except for the crust) for that perfect summer pizza fix! Spray a nonstick pan with olive oil, then heat over medium high heat. Add onions and cook for 2 minutes or until fragrant. Add ground turkey and cook thoroughly. Add taco seasoning and 1/4 cup water. Heat through and stir until meat is coated with seasoning. Remove from heat and set aside. In a small bowl, combine salsa, yogurt, cumin, and salt. Layer the mixture onto your baked pizza crust. Top with ground turkey mixture, then tomatoes, lettuce, and cilantro. Serve immediately.